Immigration still elicits fear and mistrust, and not just on the part of the receiving society despite having occurred for thousands of years throughout human history. Communities from which people migrate often disapprove of the migrants decision and consider it treacherous. The recent reawakening of the debate about immigration in the new millennium has evoked intense emotion particularly in the United States and Europe. 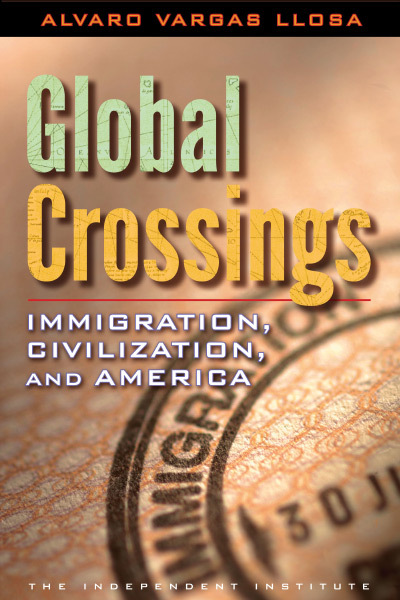 Global Crossings cuts through the jungle of myth, falsehood and misrepresentation that dominates the debate, clarifying the causes and consequences of human migration. Why do millions of people continue to risk their lives, and oftentimes lose them, in the pursuit of a chance to establish themselves in a foreign land? The book first looks at the immigrant experience, which connects the present to the past, and America to the rest of the world, and explores who migrants are and why they move. The conduct of migrants today is no different than that of migrants in the past. And contrary to the claims by immigration critics, the patterns of contemporary migration do not differ fundamentally from those of other epochs. Global Crossings then discusses immigration regarding culture. To what degree are foreigners culturally different? Can natives adapt? Can immigrants assimilate into the new society? In assessing whether critics are justified in pointing to a major cultural shift Alvaro Vargas Llosa reviews such topics as religion, education, entrepreneurial spirit, and attitudes toward the receiving society. The book then analyzes such economic factors as jobs, wages, education, and the welfare state. How can an economy continue to operate even in the face of major legal obstacles, and how have recessions and times of prosperity influencedmore significantly than government effortsthe number of immigrants coming into the United States and other countries? Vargas Llosa finds that immigrations contributions to an economy far outweigh the costs. Finally Global Crossings makes a call for open minds and provides a pro-immigration agenda for reform. The erosion of national boundariesand even the idea of the nation stateis already underway as people become ever more inter-connected across borders. This process will make immigration a defining force in the arena of competitive globalization and the people of those countries who embrace immigration will enjoy more prosperous, peaceful, and freer lives in the emerging world. 13. Do Immigrants Cost More than They Contribute? 14. Is Immigration a Left-Wing or a Right-Wing Cause? 16. Why Things and Not People? Contrary to sensationalist news reports, Hispanic immigration to the United States does not constitute an unprecedented takeover. At other times in U.S. history the population of foreign origin constituted a similar or larger proportion of the total population. From 1901 to 1913, an average of one million foreignersabout 2.5 percent of the domestic populationcame into the United States every single year, whereas recent annual immigration has not exceeded 0.5 percent of the national population. The flow of illegal immigration appears be a leading indicator of economic trends. From 2007 to 2009, the proportion of undocumented foreigners dropped by 8.4 percent in California and as much as 25 percent in Florida, where real estate markets were hit especially hard. In the greater Las Vegas, one of the fasted growing areas in the past 20 years, foreign workers began to leave in 2007. When Arizona passed its highly restrictive law in 2010, the annual influx of illegal immigrants stood at about one third of its most recent peak. This is not to say that the flow of workers responds exactly in sync with the demand for labor: border enforcement is a major impediment to smoothly functioning labor markets. Fears that immigrants to the United States will resist assimilation and make natives feel like strangers in their own country are misplaced. The lure of assimilation in the United States is almost irresistible: the second generation in immigrant families typically speaks the language of the adopted country far better than their parents, and the third generation is even more assimilated. Even so, the U.S. educational system places onerous obstacles on the educational assimilation of immigrants. Despite the Supreme Court mandate that illegal immigrant children be allowed to go to school, only ten states permit them to go to college paying in-state tuition rates. Fears that immigrant workers lead to lower wage rates are drastically overblown. The influx of immigrants to the United States from 1990 to 2004 led to a 1.5 percent reduction in the real wages of natives with less than a high-school education and cut the wages of earlier immigrants by about 10 percent. But it had the opposite effect on native workers with at least a high-school degree: it increased their wages by an average of 2 percent. The net impact was to increase average wages for all native workers by about 1.8 percent. Although many poor immigrants do use the welfare state, this represents only part of the equation. For example, although the proportion of immigrant-headed households using at least one major welfare program in the United States is high33 percent, compared to 19 percent for native householdsillegal immigrant men also have higher rates of participation in the U.S. workforce than do U.S. citizens or legal foreignersover 90 percent in 2003. Moreover, in every U.S. census since 1880 immigrants were more likely to be self-employed than natives. Claims about immigrants relying on the American welfare state must also be weighed against the fact that immigrants often bring with them an entrepreneurial spirit, and that immigrants have utilized their work ethic by founding many of the leading high-tech companies in the United States. Sergey Brin, co-founder of Google, came from Russia; Pierre Omidyar, founder of eBay, is the child of Iranian immigrants from France; Andy Grove, founder of Intel, was born in Hungary; Jerry Yang, co-founder of Yahoo, came from Taiwan; and Elon Musk, co-founder of PayPal, is from South Africa. There was a time when the word immigration conjured up images of intrepid travelers arriving at Ellis Island, possessing barely a suitcase to hold their meager belongings but embraced by a country that welcomed the worlds huddled masses yearning to breathe free. In recent decades, however, many Americans have become skeptical, even critical of this ideal, preferring instead that the nation of immigrants welcome fewer foreigners, whatever their legal status. Debates about immigration are not confined to America, of course. Indeed, most of the same concerns that preoccupy immigration critics in the United Statesworries about immigrants taking away jobs from native-born residents, depressing wage rates, resisting cultural assimilation, and putting undue strains on social servicesare common throughout much of Europe, Latin America, Asia, and Africa, explains Alvaro Vargas Llosa, author of Global Crossings: Immigrations, Civilization, and America. A native of Peru who has lived and worked on three continents, Vargas Llosa has written an insightful analysis of the cultural, economic, and political ramifications of immigrationone the most enduring phenomena of the human story. Part historical treatise and part politico-economic analysisand sprinkled with fascinating anecdotes from his personal experience around the worldGlobal Crossings is a far-reaching work that will captivate anyone curious about the drama inherit in the age-old quest to make a better life by moving abroad and about the government policies that often thwart that effort. An estimated 215 million people live today in a country in which they were not born, the most common destinations being the United States, Russia, Germany, Ukraine, and France. What motivates immigrants to uproot their lives and begin afresh on new soil? The answers vary, but often there is a common thread: a burning desire to escape economic stagnation, political repression, war, and the like, and to make a living in a country with better socioeconomic conditions. This questthe immigrant experienceis the theme of the first few chapters. Vargas Llosa begins by recounting his visit to Mexicos northern Sonora desertnear Arizonaat leading entry points for illegal immigrants attempting to cross into the United States. Before they reach the deadly heat of the American Southwest (usually with minimal provisions) or encounter U.S. border patrols, they may encounter murderous drug gangs. Travelers captured by Immigration and Customs Enforcement may find themselves detained for months before they are returned to Mexico, where they may get a free bus ride to their home region or a nights rest at an inn for repatriated border-crossers. Such stories tell an important part of the experience of millions of people, though they fail to convey the broader realities of immigration from Latin America. One truth often overlooked, Vargas Llosa explains, is that despite all the fanfare, the levels of Hispanic immigration in recent years are no greater than those of many other immigrant groups in U.S. history, with Mexicans immigrants representing only about 3.8 percent of the U.S. population in 2005. Crossing borders illegally is, of course, a worldwide phenomenonperhaps as many as 30 million people enter countries illegally each yearand Vargas Llosa recounts several recent immigrant stories from Europe. In Spain, he encounters immigrants from Mauritania, the Ivory Coast, and Algeriaeach with a harrowing story of escape from oppression in their homelands. Whether they are fleeing political violence or economic stagnation, most migrants are ordinary people reacting in ways that citizens of richer nations would in similar circumstances. Often, the deciding factor in an immigrants choice of destination is the historic connection between the two countries. Colonial relationships, for example, shaped the migration of Algerians to France, of Indians to the United Kingdom, and of Filipinos to the United States. Moreover, extreme poverty is not the main driver of international migration: the poorest people who move tend to seek new opportunities within their own country. Just as immigration is a universal phenomenon, so it seems is the failure to anticipate unintended consequences of immigration laws. One major effect, Vargas Llosa explains, is to create unnatural barriers that impede the traditional flow of people to and from various countries. Too often, people forget that barriers inhibit immigrants from returning to their native lands; contrary to widespread perception, migratory flows frequently change direction and have always done so. Mass immigration has often raised concerns about how well newcomers would assimilate to the customs and institutions of their adopted countries. The ideology of multiculturalism began as a genuine effort to correct discrimination against immigrants and othersa backlash against the backlashbut ultimately it enthroned a new ill: its obsession with minority rights and ethnic identity discounted the importance of individual rights and identity. By the mid-1980s, for example, language programs in U.S. schools strived to maintain a students original language indefinitely. This and other fruits of multiculturalism fed worries that large communities of unassimilated newcomers would make natives feel like strangers in their own country. But the process of assimilation, in the United States especially, continued apace. A multi-year study of 14,000 Hispanic adults found that only one quarter of first generation immigrants spoke English well, but 88 percent of their children spoke it very well. The results are similar across nationalities. Education and intermarriage also follow patterns of growing assimilation with successive generations. A particularly interesting facet of immigration is how cultural change works both ways: Native populations as well as immigrants have been transformed by the experience. Sometimes these changes have taken places through civil society and commerce; at other times they have been the result of new political loyalties and electoral power. Vargas Llosa concludes this section by tracing the political affiliations of Hispanic voters in the United States, noting not only their growing electoral power but also their political diversity. Vargas Llosas chapters on economics examine the relationship between immigration and unemployment, wages, and the welfare state. They compare the impact of low-skilled and high-skilled workers. They show how labor markets operate even in the face of major legal obstacles. And they show how the overall health of the economy has had a greater influence on the number of immigrants coming into the United States and other countries than have government policies. Before delving into statistical details, Vargas Llosa explains a key principle: economically driven migration is an important way in which labor shortages are corrected. In 2005, the World Bank estimated that allowing a 3 percent rise in the workforce by relaxing immigration restrictions in developed countries would enrich poor countries by $300 billion and wealthy countries by $51 billion. Of course, when the economy slows in the host country, the flow of immigrants follows suit. It is estimated that annual illegal immigration to the United States from 2007 to 2009 was twothirds the size it was from 2000 to 2005. The effect of immigrants on wages is especially misunderstood. As lower-skilled workers enter the economy, the effect is often to raise the demand and compensation for higher-skilled workers. In time, technological advances make the less-skilled workers more productive, thereby eventually raising their wages. The economic literature on the impact of immigration on native workers indicates that in a productive, free-market economy, more immigrant workers mean better wages for almost all native workers. What hurts employment and wages are barriers to createing businesses or operating them. Vargas Llosa illustrates these findings by highlighting the contributions of several immigrant groups in the U.S. workforce, including Cubans, Central Americans, Japanese, Chinese, Koreans, Indians, Filipinos, and Irish. He also notes the success of immigrant groups in other countriesincluding the Indians in Fiji, the Lebanese in West Africa, the Chinese in Southeast Asia, and the Northern Italians in Argentina and Brazil. Unfortunately, immigration foes have often treated newcomers with hostility and suspicion, even viewing them as potential allies of terrorists, as occurred after the 9/11 terrorist attacks. Economically, immigration is closely tied to the age-old phenomenon that today we call globalization: the flow of goods and capital across borders almost invariably is accompanied by human migrations. It also brings about important changes in the relationship of the newcomer to the country of origin (with immigrants often sending large remittances to family members left behind). Moreover, these changes may be reflected in immigrants political participation in their adopted countries (including the shaping of foreign policies toward their homelands). Vargas Llosas analysis of the relationship between globalization, assimilation, and political power draws on his observations from several countries. Having cleared away misconceptions about the cultural and economic effects of immigration, Vargas Llosa draws his sights on a dubious assumption often shared by both sides of the immigration debate: the notion that the nation-state is eternal. In reality, the nation-state and nationalism, its ideological offshoot, are recent inventionsones susceptible to profound changes as more and more peoples leave their ancestral lands and intermarry. What would replace the status quo? For lack of a better term, call it transnationalism. Dual-citizenship, a controversial but growing category, is one harbinger of this sea change. America may adapt to this reality better than Europe, where nationhood is more powerfully engrained in peoples psyche. If Americanization refers to the adoption not of a national character but of a credoone that embraces individual rights and the entrepreneurial spiritthen Americans may come to view this development as a logical extension of the republics founding ideals.